Akin Collective + Akin Projects are excited to present our 2019 programming in two Vitrine Galleries: Our original location at our Dupont studios which launched on October 1, 2016, and a second location at our St. Clair studios. These miniature galleries feature the diverse talent of our studio members with travelling installations rotating each month. Each artist will be featured for the one month at Akin Dupont and second month at Akin St. Clair. For more information about our artists and our programming join us on Instagram @akinvitrine. The St Clair Studios Akin Vitrine Gallery is located at at 1747 St. Clair Avenue West, near St Clair Avenue West and Keele St and is viewable from the street level and can be viewed at any time. We are excited to announce our latest exhibition into our Akin Vitrine Galleries, ‘flitting’ by Akin King member Verity Griscti. This is Verity’s second exhibit with the galleries. flitting opens in March at 1485 Dupont St, and will move to 1747 St. Clair Avenue West for the month of April. look at how pretty it can be. Outdoor Art Show, and EyeScream’s II &amp; III, the visual arts component of the Scream Literary Festival. Verity received a BFA in Printmaking from OCADu in 2004. Akin Collective + Akin Projects are excited to present our 2019 programming in two Vitrine Galleries located at Akin Dupont and Akin St. Clair. These miniature galleries feature the diverse talent of our members with travelling installations rotating each month. Each artist will be featured for the first month at Dupont and second month at St. Clair. For more information about our artists and our programming, join us on Instagram @akinvitrine. ‘flitting’ will be on view for the month of March in our Dupont Akin Vitrine Gallery, located in the Clock Factory Building at 1485 Dupont Street (entrance on Campbell Avenue). Find Akin Studio 215 on the second floor and follow the sign into the hallway around the corner. The building is open from 9am to 6pm, Monday to Saturday. The exhibition will then travel to the Akin St. Clair Vitrine Gallery and be on view for the month of April at 1747 St. Clair Avenue West. Gallery is street level and can be viewed at any time. For more information about Verity’s work, follow our Instagram account @akinvitrine. 'Fitting' by Verity Griscti - March/April 2019 - Akin Vitrine Gallery Installation. 'Fluid Streets' by Dalia Hassan - February/March 2019 - Akin Vitrine Gallery Installation. We are delighted to introduce our February/March exhibition, Fluid Streets by Akin Lansdowne artist, Dalia Hassan! dominated by the abnormalities of her urban environment with a fantasized setting. Last Summer Dalia moved to Toronto, and her work has since been transforming into abstraction. conscious imagery etched in memory. Fluid Streets is on exhibit in the Akin Vitrine Galleries beginning at 1485 Dupont for the month of February and 1747 St. Clair Avenue West in March. Fluid Streets will be on view for the month of March in our Akin St. Clair Vitrine Gallery and be on view for the month of March at 1747 St. Clair Avenue West. Gallery is street level and can be viewed at any time. For more information about Dalia and her work, follow our Instagram account @akinvitrine. 'Forest & Lakes' by Jen Pilles - January/February 2019 - Akin Vitrine Gallery Installation. 'Piqued/Peaked' by Carmina Miana - December 2018/ January 2019 - Akin Vitrine Gallery Installation. 'Perfect Circle' by Rebecca Jane Houston - November / December 2018 - Akin Vitrine Gallery Installation. 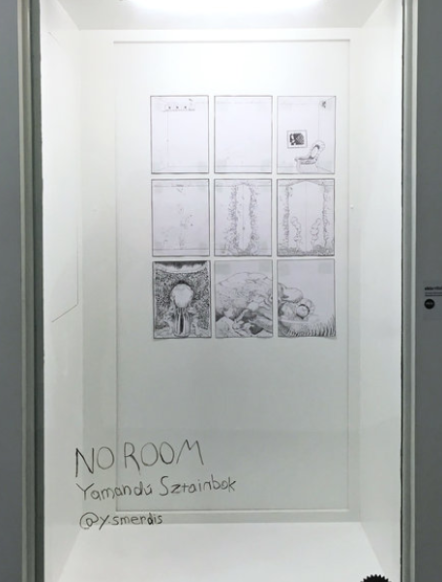 'NO ROOM' by Yamandu Sztainbok - Akin Vitrine Gallery October/November 2018 Installation. 'Twisted Fantasy' by Samantha O’Neill - Akin Vitrine Gallery September/October 2018 Installation. 'Propositional Forms' by Rebekah Andrade - Akin Vitrine Gallery August/September 2018 Installation. Our January/February 2019 was Akin King member, Jen Pilles! 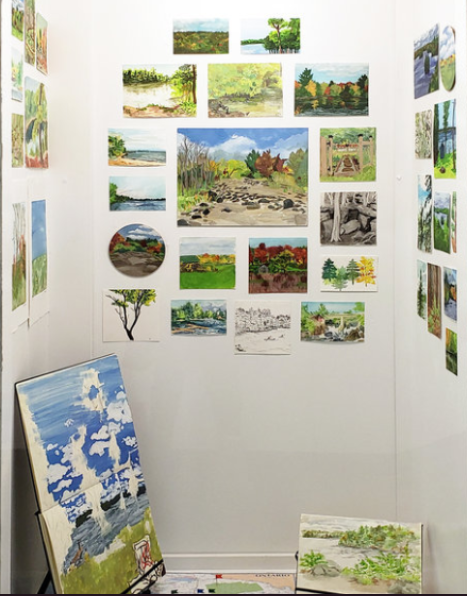 Forests & Lakes is an exhibition of plein air studies; each work created in nature using a combination of gouache, pencil, watercolour, and ink. Jen Pilles has been developing her plein-air practice for many years, finding inspiration in the Ontario countryside, and joy in the act of studying the landscape. These works on wood and paper were created in the following locations between 2014 - 2018: Algonquin Park, Bobcaygeon, Bracebridge, Brechin, Dwight, Huntsville, Oastler Lake Provincial Park, Tamworth, Toronto Island, and Warsaw Caves Conservation Area. Forests & Lakes begins its journey in the Akin Vitrine Galleries beginning at 1485 Dupont for the month of January and 1747 St. Clair Avenue West in February. Jen Pilles is a freelance illustrator and plein-air artist from Welland, Ontario. She creates charming drawings and colourful illustrations using a combination of mediums including ink, gouache, watercolour and coloured pencil. She creates work for a variety of clients including publishers, public institutions, not-for-profit organizations, small businesses, and private clients. Jen holds a Bachelor of Applied Arts with Honours in Illustration from Sheridan College. Jen has been practicing plein-air painting for over a decade and derives much of her inspiration from travelling and exploring the landscape. The work she creates out in nature informs and inspires her illustration practice. Feeling most at home out in the woods or floating in a lake, Jen is always on the lookout for new locations to draw and paint in the open air. Our December/January artist was Akin King member, Carmina Miana. Her installation ‘Piqued/Peaked’ will be on exhibit in our Akin Vitrine Galleries located at 1485 Dupont and 1747 St. Clair Avenue West over the next two months. Carmina Miana is Toronto-based illustrator. Her image making has involved embroidery, quilting, weaving, and resin. Utilizing material meaning, both historical and contextual, and puns wherever applicable, Carmina’s work engages identity, memory formation and the constant presence of failure. Carmina is a graduate of OCADU’s Illustration program, receiving a Bachelor’s of Design (Bdes). She is currently the Social Media Coordinator for the Toronto School of Art. She often collaborates with artists of varying disciplines as a way to skill share and expands her visual language. Our November/December artist is Akin Dupont member, Rebecca Jane Houston. Rebecca’s piece, “Perfect Circle” was on exhibit in our Vitrine galleries located at 1485 Dupont and 1747 St. Clair Avenue West during the months of November and December 2018..
Can I draw circles through past and current work? If I line it all up, an accumulation of stuff made over 5 years, is there a thread to draw them together? When I was in my MFA, I spent a lot of time trying to make perfect spheres on the wood lathe. It was a meditative process and more than that it was a claiming of space as a woman in a wood shop through my presence; by taking up space and time at the tools, and doing it in a feminist way that valued process over “expertise”, open experimentation over “mastery”. Of course I only see this in retrospect. In the vitrine you can see the collection of wood spheres made on the lathe in various stages of completion. In 2017, while working on a project making 100 slip cast bowls, something I hadn’t done before, I kept the trimmings by hanging them all over my studio where they dried and many crumbled. The ones left, that survived all the moving and firing and handling, are hanging here in the vitrine as well. Another set of circles, all warped and drooping. Each like a line drawing, but in three dimensions. I was partly successful in making these bowls, it was also somewhat disastrous. Finally, the two ceramic sculptures were made with casts of spheres in clay. This was just another experiment. They were to represent a bubbling up of feeling. I don’t know if it really happened but again I learned something and moved on to the next thing. I have gathered these three collections of circles together to see if there is a meaning that brings me back in circular ways through similar considerations. Or perhaps it’s just a random collection of things. Our October/November artist is Akin St.Clair alum, Yamandu Sztainbok. Yama is an illustrator, cartoonist, and essayist. His piece, “No Room” will be on exhibit in our gallery located at 1747 St. Clair Avenue West over the next month. NO ROOM is the transcription of a page remembered from a dream, mistakenly bound in the cover of the Time-Life Library of Art: World of Breughel. The story was about carnivorous rooms which feed upon and assimilate the sedentary-type rooms to which we have become accustomed. Throughout the volume were interspersed twelve pages printed in an invisible ink, which, when exposed to air for twelve seconds would absorb the atmosphere of a room. Thus the dream itself contrived to squander chance for me to transcribe the other pages. Our September/October Vitrine Gallery artist, Akin Lansdowne alum, Samantha O’Neill! Samantha is a Fashion Designer who has combined her love for both Fashion and Art. Specializing in outerwear, she creates art based pieces rather than Ready to Wear. Samantha has been passionate about fashion since her childhood and studied Fashion Business at George Brown College. ‘Twisted Fantasy’ is inspired by the idea that there is a twisted relationship between light and dark. In this work, lightness is conveyed through the use of feminine silhouettes and flowers while darkness is conveyed through the use of dark colours, textures and a certain sense of undone-ness or incomplete-ness. It’s the idea that there is a sense of torture and uncertainty even in our wildest fantasies. Our August/September Vitrine Gallery artist was Rebekah Andrade. Rebekah is a member of our Akin King studios and her installation, 'Propositional Forms' will be on exhibit in our galleries located at 1485 Dupont and 1747 St. Clair Avenue West over the next two months. Rebekah Andrade holds a BFA in Visual Arts from Emily Carr University of Art and Design and is currently completing a Graphic Design certificate, remotely, through Parsons School of Design in New York City. Our June/July Vitrine Gallery artist was Andrew Kennedy. 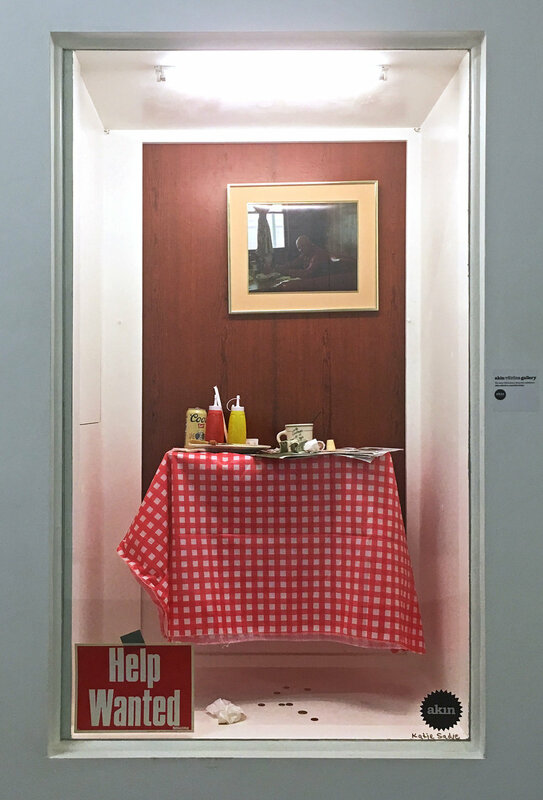 Andrew has been an Akin Dupont member since 2016, and his piece ‘Fighting Alone’ will be on exhibit in our galleries located at 1747 St. Clair Avenue West for the month of August. His installation ‘Fighting Alone’ explores issues surrounding human agency, individual dignity, and political demoralization. What might be more important; the group someone belongs to, or their capacity as an individual? Whose job is it to ‘fix’ the problems of our society; is it the citizen or the politician? Can human beings who tend to find meaning in life through their realization as an individual, also find meaning in group responsibility? The viewer is encouraged to bring their own thoughts and beliefs when considering the installation. After all, there are no ‘hard truths’ when contemplating the ephemeral atmosphere surrounding the current human condition. Andrew V. Kennedy was born in New York, NY, and currently lives and works in the greater Toronto area. He received a BFA in Illustration from Rhode Island School of Design, and an MFA in Painting from Brooklyn College. His work has always been centered around the dignity of the individual, and their life in society. Issues of politics, modernity, sociology, and our ‘inner lives’ can also be seen in his work. Kennedy’s exploration of these issues began with simple portraiture; but eventually grew to include the use of text. His work has been exhibited both in New York City, and Toronto, ON. Our June/July Vitrine Gallery artist was Akin MOCA member, Ghazaleh Avarzamani. Through the notion of nature as a medium, her piece The Exfoliation, will explore both the geopolitical and intimate connotations of home — from exile, displacement, and refugeeism on a global scale, to the everyday and extraordinary realms of domestic life and hospitality. Humans classify natural species by place; i.e., those that belong and those that do not belong to a certain location. Some plants or animals, which are “non-native” to a specific location and rapidly spread, are believed to cause severe damage to the local environment, economy or human health. These are often described as “aliens,” “invaders,” or “pests.” Increasingly, since the 1950s, both human and non-human migration discourses have used the figure of the “non-native” or the “alien” as a negative input for “native” contexts. The Exfoliation re-thinks the “alien” as an entity that actually constructs a new reality and brings valuable cultural hybridization. As a result, the idea of the pristine landscape and who defines it is questioned, as perceptions of “native,” “alien,” and “invasive” species profoundly change over time. Ghazaleh Avarzamani’s selected exhibitions include Vestfossen Kunstlaboratorium museum in Norway; Bocconi Gallery in Italy; Ab/Anbar Gallery in Iran; Asia House in the UK; Etemad Gallery in UAE; and Artmark gallery in Austria. She has been the recipient of Toronto Art Council in 2018, Ontario Art Council award in 2017 and the Red Mansion Art Prize in 2013. In 2016, She curated Jabberwocky, a group exhibition at Ab/Anbar Gallery in Tehran. Our May/June 2018 artist was Kate Drwecka of Akin St. Clair. Her installation is based on her most recent project, Becoming: a 31 page printed horror comic, the first in a series of mini comics exploring horror’s ability to process real trauma through representation. The original pages measure roughly 16.75" x 21.25", and the final product is a mini-comic that is 5.5" x 8.5". This installation features some of the original pages, and a recreation of the iconic mirror and monster from the comic. Becoming is a story of repression, denial of self, and how that presents itself in our lives. Laila is a woman who lives alone with her past, haunted by a ghastly figure living in her mirror. The reflection calls to Laila's unacknowledged history, begging her to confront her denied history. As Laila continues to refuse her past, the figure in the mirror grows stronger, to eventually manifest outside the mirror. Kate Drwecka is a freelance cartoonist/illustrator working and living in Toronto. She grew up in the cold climates of Canada, and studied at the School of Visual Arts in NY. As a small child, Kate wanted to grow up and become Freddie Mercury. She still does. Currently Kate is working on a series about an all-girl supernatural detective agency, and a series of horror comics. Kate is an original member of the Akin Comic Club and has recently helped organize our the Akin Comic Day event, a one-day celebration of comic books, comic making and comic artists! Our April / May 2018 artist was Jill Smith of Akin Dupont. Transforming space into narrative, mother / rhythm presents a series of bodily sculptures that come together to explore complex power-based relationships. This installation emphasizes materiality, scale, and gesture as elements that have the ability to relate to human forms and body movement. Primarily using clay and concrete, mother / rhythm demonstrates a compassionate, yet commanding relationship between ambiguous material bodies. Jill Smith is an interdisciplinary artist based in Toronto, Ontario (b.1995) and recently completed a Bachelor of Fine Arts (Honors Specialization in Studio Art) At Western University. Her most recent work explores the fragility and absurdity of the body and mind, as well as the connective possibilities of materiality. Smith has exhibited work in galleries across Ontario, such as the Artlab Gallery, Forest City Gallery, The Arts Project, Open Studio, and Earl Selkirk Gallery at ARTiculations, as well as Friends and Neighbours Gallery in Montreal, Quebec. She has recently participated in artist residency programs at Sparkbox Studio in Picton, ON (May 2017) and at AGA LAB in Amsterdam, NL (September 2017). Currently, she is a member of the AGO Youth Council, and has upcoming residencies with Graven Feather and Artscape Gibraltar. Our April 2018 Akin St Clair Vitrine Gallery artist was Sarvenaz Rayati. Sarvenaz is a multidisciplinary artist and an Akin Lansdowne studio member, . Her new installation 'The Embrace' will be on exhibition at the Akin St Clair Vitrine Gallery. Her work discusses ones love or longing for nature, particular mountains and trees. Our February / March 2018 exhibition was by Akin Lansdowne member, Eloisa Morra. Eloisa’s work deals with the problems of perception in figurative painting and the inclusion of multiple narratives in a picture. As Philip Guston once wrote, “A good painting should be a clear enigma”. How can the artist create a visual alphabet, avoiding both the trivialization of reality of naturalism and the stillness of the symbol? Clear Enigma presents an imagined space where two different creatures — the Eye and the Duende — meet, exploring the multiple feelings and stories generated by their encounter. Our March 2018 artist was Akin Dupont member, Kayla Polan. Chris is a self taught artist living and working in Toronto. He is an Akin Dupont member whose artwork explores the relationship between our city’s constant state of construction and its citizens. Chris creates vibrant sculptures with plexiglass, objects seen and unseen, that shape our world and envision the future. Venturing into the bizarre and humorous, this installation, ‘Pretty Bird’ combines two mundane objects, made with a minimal aesthetic, to create a playful, laughable environment. Exhibition runs for the month of February in our Akin St. Clair Vitrine Gallery at 1747 St. Clair Avenue West. Gallery is street level and can be viewed at any time. Our December 2017/January 2018 exhibition was entitled “All Are Welcome” by Akin Dupont member, Bernadette Peets. “I have been thinking a lot about how recent immigrants and in particular refugees who come to Canada feel about us, this country and in particular what their experience is of our landscapes. Is Canadian society the open, warm and friendly culture that we like to think it is for these newcomers? Is our pristine landscape available to them? Does it represent a refuge or is it viewed as threatening due to its vastness and unknown dangers? I often use wild animals in my shadow boxes to represent the vulnerability of the human characters in the narrative. In this case, the deer with the bullseye carries the symbol of the 'hunted' while at the same time acting as a warning to these individuals. The orange screen across the front is meant to slightly obscure the scene so that the viewer must look even closer to be able to see it completely. The screen says "All Are Welcome" but also acts as a barrier or an enclosure reminiscent of a refugee camp. The scenes on the side walls remind us of the origins of the travellers and the reflective surface creates a way for all of the scenes and characters to merge. Bernadette was born in Toronto where she currently lives and works. Her studio is in the Akin Collective at 1485 Dupont Street. She graduated from the Ontario College of Art and Design in 1996 where she majored in Drawing, Painting and Art History. She lived in Florence Italy for two years (1987–88 & 1994–95) where she continued to study Art History and develop her craft as a painter. 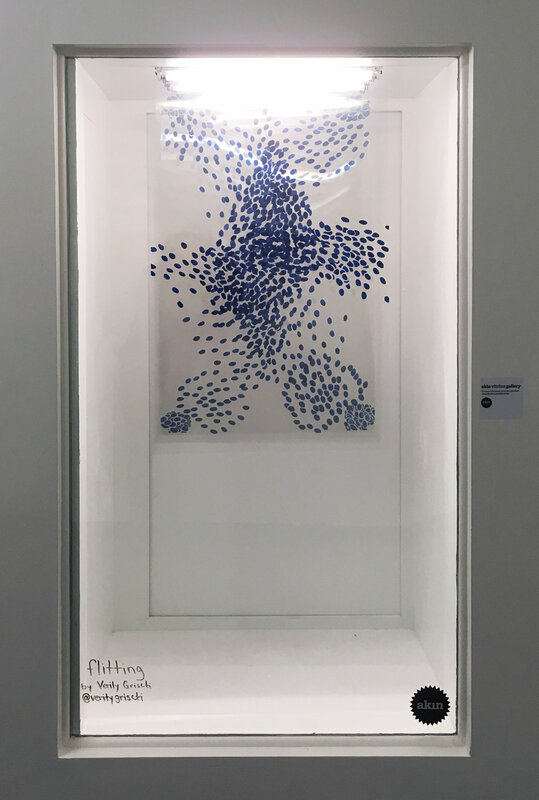 She has explored many themes over the past 20 years of her art practice and while she has mainly used painting as her medium she has also included three dimensional installation work as well as other pictorial devices that include shadow boxes, photographs, drawing and printmaking. Her subjects of interest have been rooted in her political, social and aesthetic ideals. Whether she is using her work as a platform for a discussion on topics as diverse as the female body image to issues relating to the Indigenous Nations in Canada, her approach is always connected to her strong sense of design, colour and technical precision. Craft is important to her as an effective means of communication. She believes that having a high quality of execution in her work facilitates a more effective communication of her intent. November’s exhibition, “Buckshot Deli and Diner’ was created by Akin St. Clair member Katie Sadie! Katie Sadie is a graduate of the Applied Photography program at Sheridan College. She was recently announced as a winner of the Flash Forward Emerging Photographers Competition presented by The Magenta Foundation, 2017. Katie’s current personal practice has involved using primarily colour negative film. Her work is inspired by the great photographers of the past and the people she surrounds herself with in the present. Katie aims to question ideals and start conversations by covering a wide variety of topics through documentary photography. Amanda Wand’s new work, Emotional Acceptance, is a true representation of allowing and accepting all emotions. No emotions are good nor bad, they just are. She wants to provide a space for people to feel reassured that everyone is battling their emotions in different ways and that is what creates a beautiful social human experience. She uses the gallery space to bring together people who are mindful of social justice, and who can benefit from artwork that provides healing, inspiration, and empowerment. This show is about honestly accepting how you feel and taking the time to appreciate your feelings and how they shape you as a human being. Mando, also known as Amanda Wand, is a Toronto based abstract artist. She allows herself to be guided by what she’s feeling, creating pieces that are imbued with emotion. The process of each piece is of utmost importance to Mando, as she wants the artwork to represent the wide range of human emotions we all possess. She finds inspiration in communicating the difficulties of processing social inequality in the world. Using her artwork as a reminder for everyone that it is imperative that we pause, reflect, and allow ourselves to express our emotions in order to move forward. Her artwork is the most honest representation of herself and she hopes to inspire moments of introspection in others as she finds the process of creation as a form of survival. September 2017 featured new work by Akin Lansdowne studio artist, Claire Correia. Laurie Anderson – excerpt from The Dream Before. 1989. Claire Correia is a multi-media artist who works with both two and three-dimensional media including soft glass, in combination with small scale metal-working, paper engineering, and use of wood and other materials. Her installations, relief wall pieces and kinetic sculptures express ideas about energy, environment, and the Earth as a living entity. Claire also is a mother, paints, maintains a rigorous sketchbook practice, is a design educator in the School of Graphic Design at Seneca College of Applied Arts and Technology, and is a pastry cook at the Dundas Park Kitchen in Toronto, Canada. Enrique Velez Gaudite is a storyteller. Using imagery and text, found and original, he aims to compare and contrast the power of media in its digital and analog forms. He works in marketing communications by day and on his practice beyond the 40 hours outside of the fluorescent box. His work questions sincerity in social media and problematics that come with economics, love, and other conventions. Enrique is a current member of Akin’s Dupont Studios and his installation, 404 will be on exhibit for the month of August 2017. He's also the founder of a small press called Particular Instances of the Possible which specializes in publishing books, zines, artists' prints, and objects. Our July exhibition was entitled ‘Rimless’ by Akin Dufferin member, Verity Griscti. A drunk staggers home, an animal forages for food, a gambler wins and loses a fortune on a dice roll, and the scientist plots their every move neatly on a graph. Eventually, a model is determined and an algorithm created and all the romance gets sucked out of nature. We run around modelling everything: molecules, bird flight, real-estate prices. We measure everything we can't predict and take comfort in it's tamed presentation between neatly labelled x and y-axes. Mathematicians, economists and biologists model randomness in the hopes of unlocking a better understanding of their subjects. I model randomness because it's messy, often plain and occasionally beautiful, even whimsical. Chance will ultimately roll over neatly defined borders and overflow onto its surroundings. It may look plain, divine or foul but it's a force that's always there. Verity Griscti is an artist and jill-of-all digital trades based in Toronto. Her studio practice explores generative systems and seriality in both analogue and digital mediums. She's built numerous websites including the award-winning Biographical Dictionary of Architects in Canada and has participated in various exhibitions including The Toronto Outdoor Art Show, and EyeScream II: The Visual Life of Words and Eye Scream III: Revenge of the Glyph, the visual arts component of the Scream Literary Festival. Verity received a BFA in Printmaking from OCADu in 2004 and is currently enrolled in Ryerson University's Computer Programming Applications Certificate in a move to go 'all in' on this internet thing. Our June exhibition was entitled ‘Long Road’ by Akin Dupont member, Laura Kay Keeling! Our exhibition for the month of May featured new work by Akin Lansdowne member, Jessica Thalmann. High-Rise is a site-specific installation of hand-folded archival pigment prints investigating the exploding steel and glass landscape of downtown Toronto as a veritable condoland converges onto the apex of the city. The strange lives of condo-dwellers seem at once compact, luxurious and quietly desperate as reflected sunlight bounces between glass curtain walls, almost folding one unit onto one another, never knowing where one begins or ends. Photographs of glass condos are folded using a special Miura pattern named for its inventor Japanese astrophysicist Koryo Miura. A Miura fold can be packed into a compact shape, and unfurled in a single motion. This pattern has even been used in solar panel arrays for space satellites in the Japanese space program have been Miura folded before launch and then spread out in space. Jessica Thalmann is an artist, curator and writer currently based in Toronto and New York City. She received a Master of Fine Arts in Advanced Photographic Studies from ICP-Bard College and a BFA in Visual Arts from York University. She has worked at the Doris McCarthy Gallery, Toronto International Film Festival, C Magazine, the Art Gallery of York University and Yossi Milo Gallery. She has shown at various venues in Toronto, Vancouver and New York City including the Art Gallery of Mississauga, Flash Forward 2010, Whippersnapper Gallery, Nuit Blanche, the Artist Project, VIVO Media Arts Center, Aperture Foundation, the International Centre of Photography, Photoville, the Camera Club of New York and Printed Matter’s New York Art Book Fair. "A Measure" is an ephemeral multi-media installation by Toronto artist and Akin Lansdowne member, Emma Aurelia on exhibition for the month of April. A hand dyed, hand woven sand bag resembling water hangs from the ceiling by industrial chain. The bag has been filled with 20 kg of both wet and dry sand. Grains seep through the open weave of the cloth representing the time sensitivity of threats posed on natural resources. Graduating from OCADU's fibre program, Emma works primarily in textiles but her practice extends in many other directions including sound and ceramics. Emma was the recipient of the AKIN Collective Career Launcher Award granted to a student based on work exhibited at OCADU's GradEx 2016. New work from Akin Dupont member, Adria Mirabelli launched on March 1 in the Akin Vitrine Gallery. Her installation was intended to be a space of visual escape and an affirmation of the importance of self-care. On view 24/7, time is an entity of interest inside a vitrine space. The vitrine offers a brief escape into another world- one whose welcome extends as long as the viewer chooses to stand in front of it. Winter can feel long and relentless and it is during these months that we often consider time with a heightened awareness. The days are shorter, and we desperately try to hold onto the light that leaves us. Cut from white vinyl, sprawling floral drawings fill the vitrine space with motifs of St. Johns wort, lavender flowers, wild roses, peonies and hemp leaves which are often regarded for their healing properties in combatting anxiety, depression and restlessness. The drawings are projected with soft beams of coloured light, which are controlled on site through Adria’s iPhone, changing in colour throughout the month. Adria Mirabelli graduated from the Ontario College of Art and Design in 2015 with a major in Drawing and Painting and minor in Fibre. Having also studied at Parsons Paris, her work is influenced by craft and design processes. Her practice is driven by an experimental approach to mark-making whereby she integrates textile manipulation processes with drawing to create large scale works on silk, felt, vinyl and paper. Adria has created site specific installations at Gallery 1313, Xpace Cultural Centre, Artscape Youngplace, the Artist Project 2017 and was a resident at The Roundtable Residency in 2015. She lives and works in Toronto. Our February installation featured work by Kyle Yip, a member of our Dupont Studios. Multimedia artist Kyle Yip also known as Discrete, is a Toronto based artist, DJ, producer and label owner of Savvy Records. He is known not only for his first full-length album, 'The Midas Touch' which garnered him a nomination for 'Best Electronic Album of the Year' at the 2016 Canadian Juno Awards in Calgary, but also his remixes for international artists such as Brabe, Society of Silence and many more. For his album, Kyle intertwined his love for jazz, disco and soul with a deep-house and techno tinged sensibility. This medley of inspirations were crucial to constructing a sound that is not only exuberant and enigmatic, but also nostalgic and thoughtful. A similar description could be given to his paintings which are equally as energetic yet considered through his use of colour and composition. Conceptually, his work explores the relationship between the concrete and the abstract. More specifically, the left and right hemispheres of the mind as well as physical and spiritual realm. Our January exhibition was by Rebecca Jane Houston, a multi-disciplinary artist who works out of the Lansdowne Akin studios. Her recent work has been with clay, making plaster casts of “Kee Klamps" and pipe in various clay bodies. This meditation on the form of temporary infrastructure is still in its experimental phase and is shown here in the Akin Vitrine as a work in progress. Rebecca often works for a long time with a particular material or form, and allowing repetition of a joint or object create its own abstract narrative. Sometimes, the process leads towards finished pieces if that seems appropriate, but not always. Rebecca has worked in the community arts for many years, sits on the board of Mercer Union and is the proprietor and curator of The Northern Beaver Gallery, a vending machine art project. 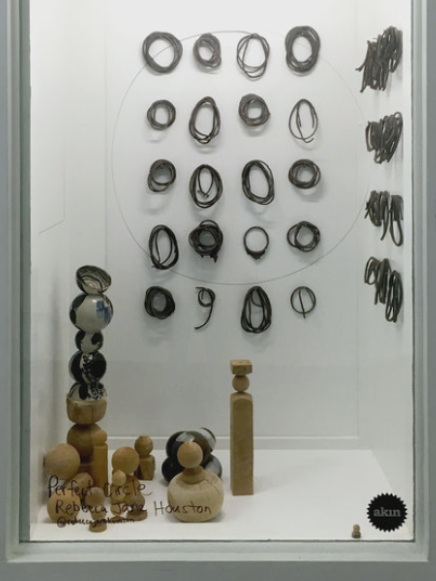 The Braids ran for the month of December 2016 in the Akin Vitrine Gallery. This new work from Akin member, Nicole Krstin is part of an ongoing series intended to foster dialogue, awareness and understanding about women’s health issues. Nicole Krstin is a visual artist, currently focusing on film photography and painting. She is a “retired” graphic designer, holding a BA from the University of Toronto, with a Major in Anthropology and a Minor in English. Nicole describes herself as being known for incessant mouth breathing, an unrelenting admiration for cats, and saying weird things in-person and on social media. She is uni-coastal, splitting time between Toronto and Brooklyn. Our November 2016 exhibition featured the collaborative work of Akin members, Erin Enns and Shanna Van Maurik (AKA: Paper Bag Beers) and runs for the month of November. Paper bag beers is a Toronto-based collaborative composed of two extraterrestrial rainbow children, Erin Enns and Shanna Van Maurik. Since 2013, they have been creating work together and sharing their love for the kind of colours that hurt your eyes. Enns' background is in illustration and design and Van Maurik's is in fine art, and painting. The combination of their two distinct styles creates work that falls somewhere in between fairy tale illustrations and dystopian toxic wastescapes. They illuminate planets unseen by the human eye, sometimes showcasing the creatures that inhabit them. Exhibition includes two hanging pieces, Scumland Lazy River and Crusty Junk Caverns, both gouache on panel, 24x24” and a sculptural element titled, Bubblegum Valley Install. Our first exhibition, SAT.00001 ran for the month of October, and featured brand new sculptural work by Chris Harms. Chris has been a member of Akin Collective since 2013. His vibrant and elegant sculptures are made with hand-cut plexiglass. Harnessing light and colour, Chris’ work is intended to build a feeling of expansion and possibility, and functions as an exploration of space and physicality through his own aesthetic sensibilities.